As I started learning more about art journaling this month I looked around online for good resources for new art journalers that would help me and that I could share with you. One fun way to dip your toe into art journaling is the free, 12-part ecourse from Kristal Norton. This course provides a nice overview of materials, basic techniques and inspiration to help you get started. It comes daily via email for 12 days, which is enough time to give a good introduction without getting too overwhelming. It’s a mix of blog posts and videos that encourage creativity without being dogmatic about what sorts of materials you use or how your pages ought to look. She’s even kind enough to remind us — whether you’re a new art journal practitioner or have been exploring the medium for a while — that ugly pages happen, things will not always turn out the way we plan, and things that are really awful can always be painted or gessoed over so we can try again. She also shows her process and how she may go over the background of a page over and over again to get the colors the way she wants them. I’m not willing (or maybe able) to spend that kind of time on a page right now, but it’s nice to see that even pros with a lot of experience need to take their time and be willing to give themselves do overs, and that creative exploration really is a vital part of the process. 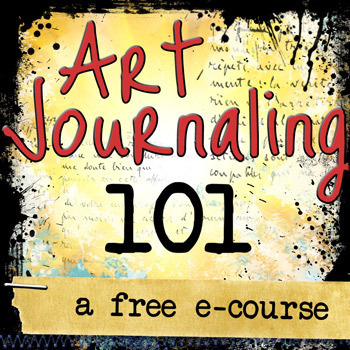 This free course is certainly worth your time, whether you already art journal, are just getting started or even if you’re interested in trying it out and need a little gentle push to get you started. Love to do this free e course ..